Nauman began working as a painter but began to make objects, performance pieces, and films in 1965. He is a diverse artist who has worked with a wide range of media, including sculpture, video, film, print, performance, and installation. Nauman began studying mathematics before changing to art, which I think shows in his systematic understanding of space. He has been described as exploring art as an exploration of life. He uses his own body, person, and inquiry to examine art and the role of the artist. He is interested in the everyday and objects found in everyday life. Nauman focuses on the concept and creation of individual works rather than attempting to create a characteristic style. He made sculptures based on the backs of objects or molded from parts of his own body. Works with the notion of hiddenness or inaccessibility and neon pieces with words (sometimes making the words illegible). His more recent works have focussed on performances shown through film (like ‘Bouncing Two Balls between the Floor and the Ceiling with Changing Rhythms,) and installations involving a form of spectator participation (including a narrow corridor that invites the viewer to enter the constricting space to see a video played at the other end) and exploring the effects of parallax, audio-tactile separation, disorientation, etc. Bruce Nauman. (1967-68) Bouncing Two Balls Between the Floor and Ceiling with Changing Rhythms. 16mm film transferred to video (black and white, sound). 10 min. 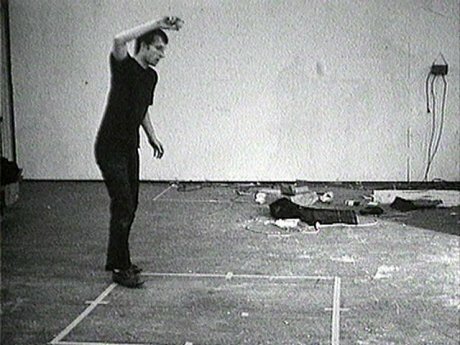 Nauman filmed himself walking the perimeter of a large square drawn on the floor of the gallery. He exaggerates his walk throughout the film, drawing attention to the action around a systematised space. He placed a mirror on the floor of the gallery to show the viewer what they might not otherwise see. Nauman work is a wonderful example of the balance between interaction and artwork that questions through presence. The viewer is not necessarily aware of their participation, at least not in the traditional sense. His corridor piece changes the space to direct the viewer, both in their interactions with the spatial and contextual aspects of the work and, potentially more interestingly, with each other. Bruce Nauman (1969) Performance Corridor. Nauman, B. (2005) Please Pay Attention Please : Bruce Nauman’s Words : Writings and Interviews. MIT Press. USA. MoMA (Undated) Bruce Nauman. MoMA [Online]. Found : https://www.moma.org/artists/4243. Accessed : 27th January 2018.